A fan-favorite summer camp is returning from last year: Science Exploration! 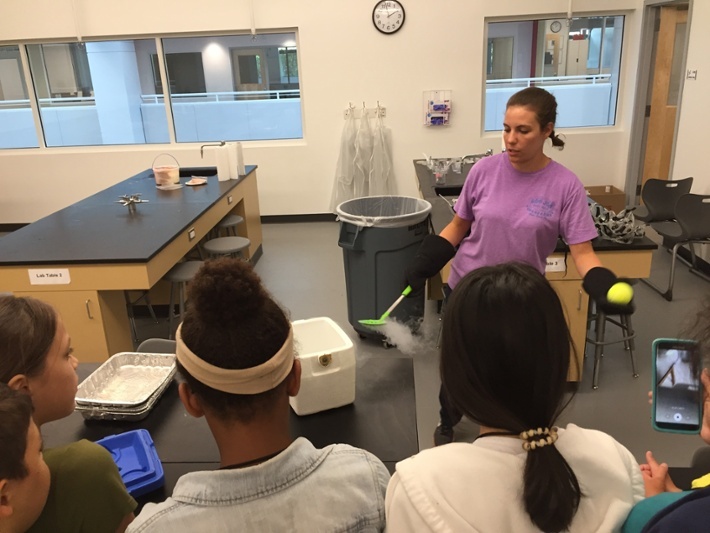 From building gliders to investigate which design goes the furthest to making ice cream using liquid nitrogen, students will have a blast learning by creating. Students will engage in hands-on, group-based chemistry, biology, and engineering experiments to deepen their understanding of scientific concepts. There are two age groups for this camp, grades 1–4 and grades 5–8, and each will have age-appropriate experiments. Middle school students will also gain improved laboratory skills, learn how to properly read a graduated cylinder, and light a Bunsen burner. We spoke with Science Expert Teacher Dr. Hartman to learn more about this electrifying course. Read her full bio here. Why did you decide to teach Science Exploration this summer? I decided to teach the science exploration camp again this summer because I had a such a great time conducting the camp last year! The focus of the camp is to learn about science using a lot of hands-on experiments/activities. It’s such a great experience for me to see the excitement and fascination the students express while conducting labs that they might not get a chance to perform during the school year. And without looming quizzes or tests on the concepts, students are able to experience science and labs in a non-stressful way, which hopefully will make future science courses more enjoyable. Why should a student sign up for this camp? If a student is interested in science, wants to know a little bit more about how our world works, likes hands-on activities and making a mess, and is interested in making new friends, they should sign up for this camp. The camp is not designed to be intimidating for students who don’t have a strong science background, but it can help strengthen lab skills and generally prepare a student for future science courses. After taking the camp, I’ve had students tell me how they were later the “know-it-all” at a local science museum or in the school year when they answered all the questions the tour guide/teacher had on a specific concept because we had conducted similar labs during the summer. I love hearing these stories because the students were able to demonstrate their understanding and they had a moment to academically shine, which are both highlights for any teacher. What are some examples of activities or lessons you have planned? The experiments vary with age groups and I’m still brainstorming, but right now I’m thinking of investigating polymers with various types of slime, evaluating the effect liquid nitrogen has on different materials (flowers, food, materials like playdough), engineering bridges and rocket ships, and learning more about food chemistry by making rock candy, ice cream, and art with milk and vinegar. Join the exploration! Register now. Learn more about these camps and more in Summer Spotlight blogs here. BASIS Independent Summer offers a variety of academic and recreational programs for kids age 4 through grade 12. Camps run July 16–August 10. To learn more about BASIS Independent Summer, visit our website.